Panoramic views come naturally to this stunning home. Berkeley’s Grand View Drive was aptly named, with dramatic bay, bridge, and San Francisco city views from the surrounding Claremont Hills neighborhood. Our Home of the Week, at 1516 Grand View Drive, offers the same unobstructed views from nearly every room. This stunning, contemporary Berkeley home for sale was crafted with soaring, wood-beam cathedral ceilings, 8-foot glass doors, and a unique and versatile floor plan, with room for three bedroms and three baths, a secluded spa, and a greenhouse observatory. The open living room and dining room are spacious and inviting; the master bedroom and guest suites are private, located on their own levels and with separate entances. The living room and dining room are open and airy. 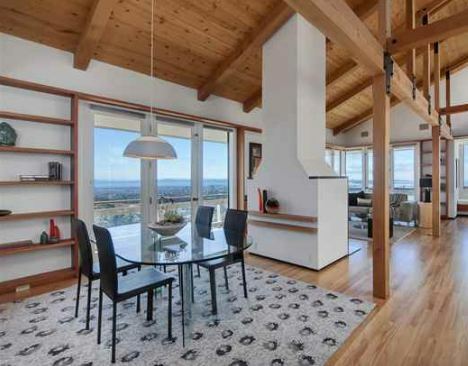 Learn more about 1516 Grand View Drive, Berkeley.